Massachusetts Life Sciences Center has awarded Cambridge Consultants and non-profit enterprise Diagnostics For All $1m to develop a low-cost point-of-care device for testing patients in remote areas for the Ebola virus. The goal of the project is to develop a device within months that is simple to use, delivers results quickly, and is suitable for use in areas where there may be little or no access to medical facilities or trained doctors, nurses and lab technicians to administer the tests. Diagnosing Ebola, from a logistical perspective, is extremely challenging. Particularly in rural areas of countries where it is endemic, it is currently a challenge to get patients to a clinic to have their blood drawn and it must then be transferred to a lab and tested on specialty instrumentation by trained technicians. When results are obtained, health workers must then find the patient, who, if infected, could already be spreading the virus. Hours or days may pass between taking a blood sample and providing medical treatment. With the planned device, a minimally trained health worker will be able to administer and run the test, without a lab, and get results within an hour. In addition, with a portable device, the test can be taken to the patients. The device will be a handheld, single-use disposable device that is smaller than a deck of cards. It simply requires a health worker to prick a patient's finger and directly apply a droplet of blood on to the device. 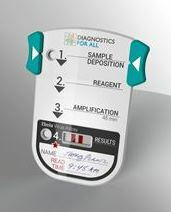 All aspects of the diagnostic assay are then fully integrated inside the device. The entire process will be completed in 45 minutes. The target cost for the new device, which is expected to be developed, produced and in field testing within six months, is less than US$10 per cartridge.